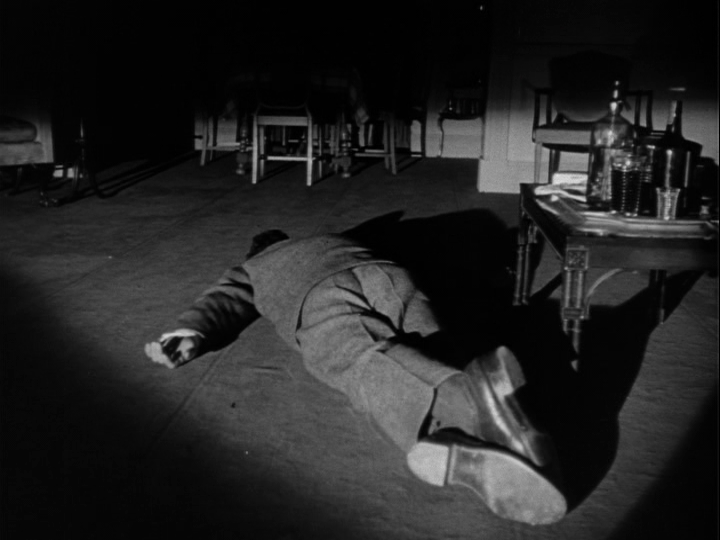 When a Jewish man (Sam Levene) is murdered in his apartment after socializing with a group of soldiers in a nearby bar, a detective (Robert Young) investigates the case. 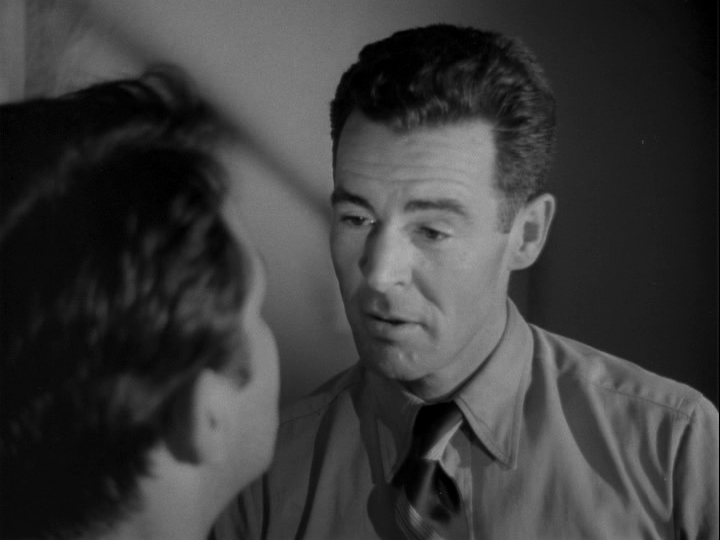 While the presumed culprit is a drunken soldier (George Cooper) who visits a dance hall girl (Gloria Grahame) while pining for his wife (Jacqueline White), Cooper’s anti-Semitic platoon buddy (Robert Ryan) soon arouses suspicion as well. After our rough-cut showing to the sound and music department, one of the young assistant sound cutters, an Argentine, complimented me on the picture. “That was our chief reason for making the film,” I answered. I stared at him in astonishment. “That’s why we made the film”, was all I could think of to say. 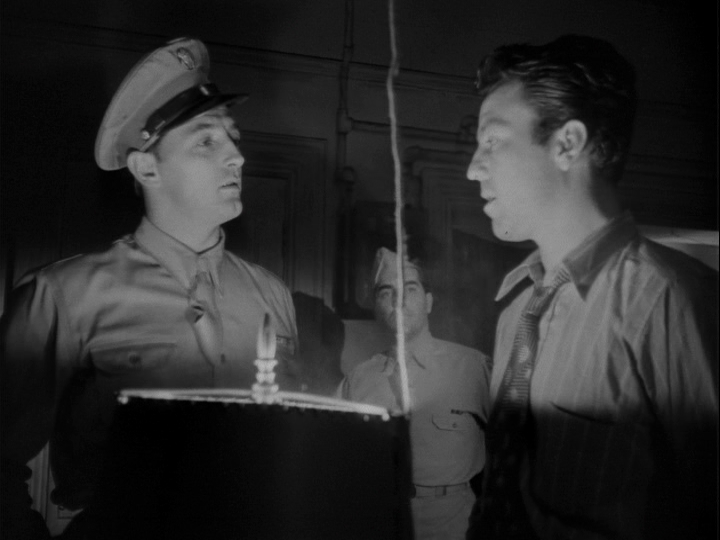 As a noir, Crossfire works exceptionally well, with each frame maximizing use of light and shadow to heighten the drama and suspense; Dmytryk and his crew managed to get the film made with only 150 set-ups (be sure to listen to the commentary soundtrack on the DVD to learn more about the film’s production, as well as Dmytryk’s blacklisting by HUAC). Equally impressive are the stellar performances, most notably by Ryan: check out his soulless eyes as he tells a faux flashback tale to Young, and his chilling scene with terrified Steve Brodie as “Floyd”. Grahame is also a stand-out in her supporting role as a world-weary dance hall girl with a mysterious man (Paul Kelly) living in her apartment. Yes — definitely check this one out. Listed as a film with Historical Importance in the back of Peary’s book. 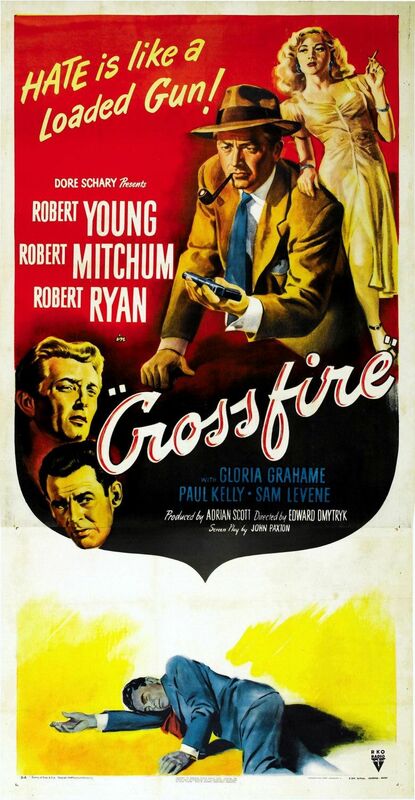 I was on a Robert Ryan kick last year and got this from Netflix. Memory is fuzzy on a lot of the narrative, but I remember Ryan’s character as horribly manipulative and effectively menacing and there being more than adequate tension. 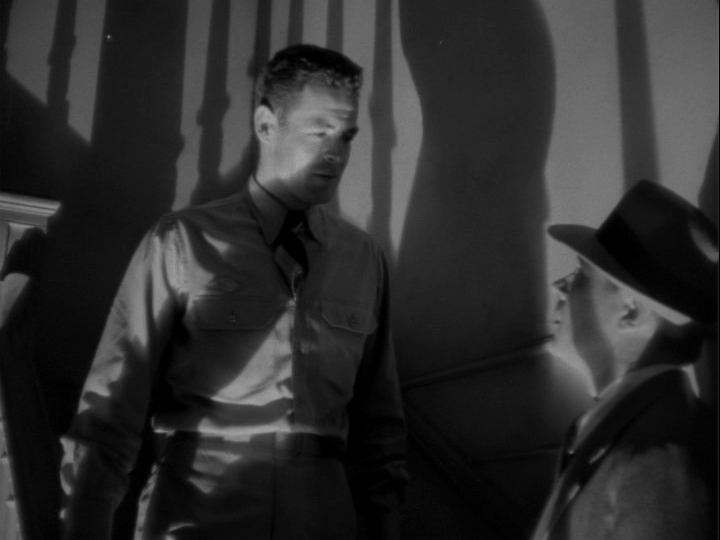 I would love to watch this noir classic again soon. No-brainer must-see, and it holds up well on (and possibly benefits from) repeat viewings. 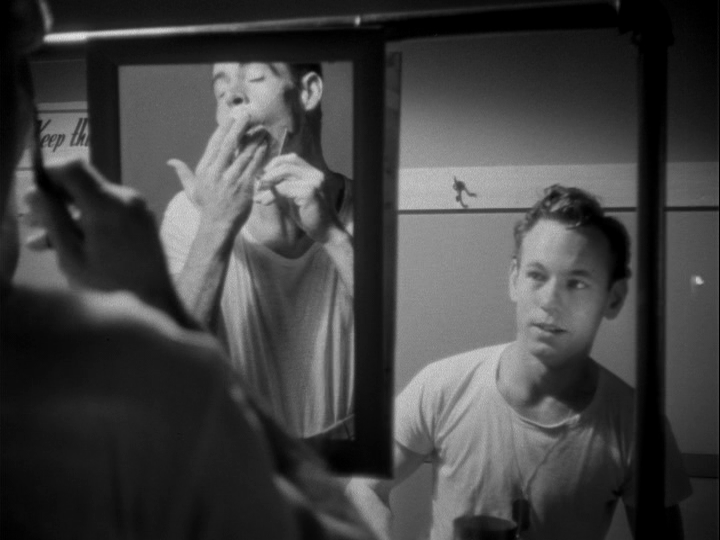 To my view, this is a perfect film, even considering the ‘necessary’ central switch from homosexuality to anti-Semitism. 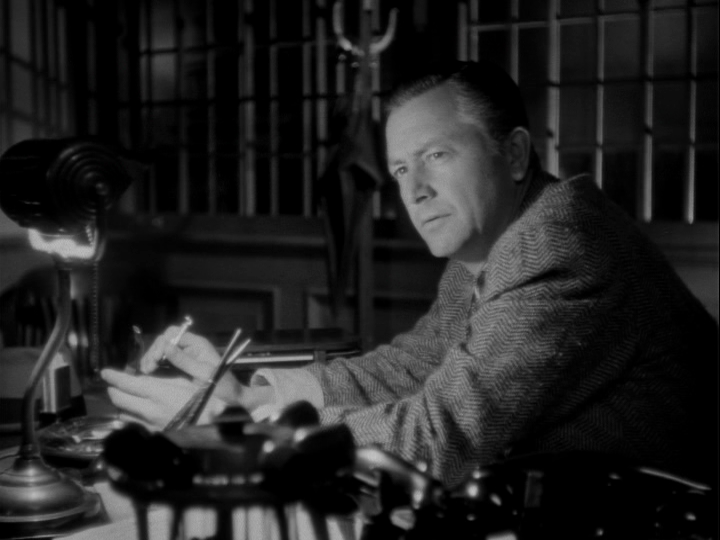 As Dmytryk explains in the same extra, the audience for the film was mainly gathered through its being a rather detailed (and cleverly constructed) murder plot. 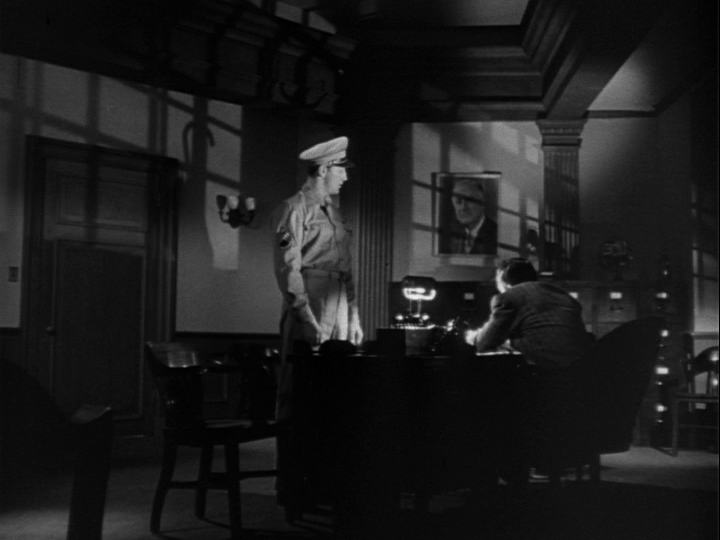 All other elements in the film – including the additional subplots of a) the psychological effects of war on soldiers, and b) a soldier’s feeling of inferiority as he tries to re-establish himself in society – take a back seat to the murder story that easily takes up the largest chunk of the film. It’s only near the end that the film begins to feel ‘comfortable’ enough letting go of being a genre film to make way for the social statement it wishes to make . And what a statement it is. When he talks to the young soldier who eventually helps him crack the case, Young makes a very compelling remark about what really happens in the underbelly of life: “That’s history, Leroy. They don’t reach it in school, but it’s real American history just the same.” In school, we do seem to be taught more often about the general facts of what happens, but much less about the real, unvarnished reasons why. In Kazan’s ‘Gentlemen’s Agreement’, the reality of being Jewish is hammered over the heads of its audience from start to finish. That’s not a criticism (I’m a great admirer of that film). But in ‘Crossfire’, the same point is made clear in a fraction of the time – pointing up the fact that, in one main sense, the various reasons for or behind prejudice can be irrelevant: bigotry is wrong; end of argument. Note: Is this the only film in cinema history that boasts three leading actors having the same name of ‘Robert’? …Possibly.